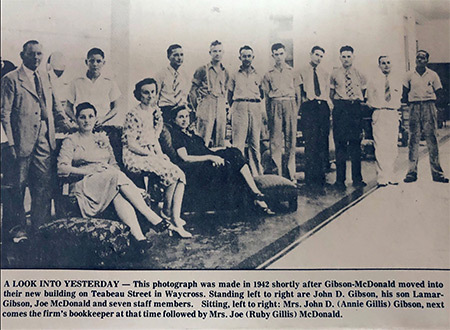 Our grandfather, John D. Gibson, along with Joe McDonald, opened a small furniture store in Waycross Georgia and over 80 years later, with the fourth generation of the Gibson family, Gibson Mcdonald Furniture has become South Georgia and North Florida’s largest furniture company. We strive to offer the most current styles and the highest quality home furnishings available and all at the lowest possible price around! See for yourself how Gibson McDonald’s down home service and quality furnishings with fantastic prices has made us the leader in service, quality, and lowest price in home furnishings around! This photo was taken of a “Gibson McDonald Furniture Company torture test”, where Gibson McDonald laid their carpet outside of a local gas station to show how well it could stand up to dirt and high traffic.